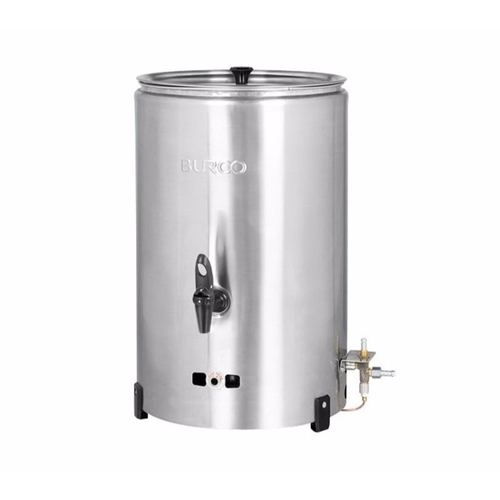 Manual Fill LPG 20 Litre Hot Water Urn is an ideal Dispenser for Tea, Coffee and Hot Drinks. The deluxe model comes with a Piezo ignition which allows for easy and safe use. This Stylish, Potable and Efficient Boiler is suitable for use in Catering, Retail and Commercial enviroments such as Offices, Construction Sites, Sports, Leisure & Church Halls and Clubs. With a 20 Litre capacity, Patented Twist Lock Safety Cap, A super fast 50 Minute Heating Time and variable temperature settings from 0°C to 97°C, you can make a great hot beverage over and over again just the way you like it. Installation of this Water Boiler is easy; simply connect to a gas canister, then all you need to do is wait! Note: This Product requires a compression fitting for complete installation (sold seperately). This model is designed for industrial use on worktops and flat surfaces, and should be secured by bolting down to a stable surface. Unfixed freestanding use is not reccomended. We have had a lot of boilers in our church halls over the years. This is undoubtedly the best yet. Deluxe is worth the extra money.